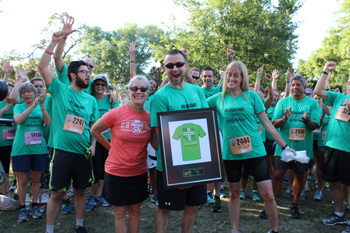 Team box includes: Bib #'s, t-shirts, safety pins, race day information. - For registrations completed by 11:59 pm on March 30: The Team Captain must pick up the team box. - For registrations completed March 31 - April 11: Bib and shirt are available for pick-up by last name. 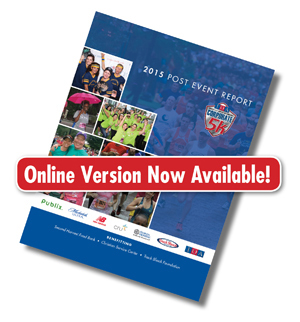 THERE IS NO RACE DAY REGISTRATION OR PICK-UP. 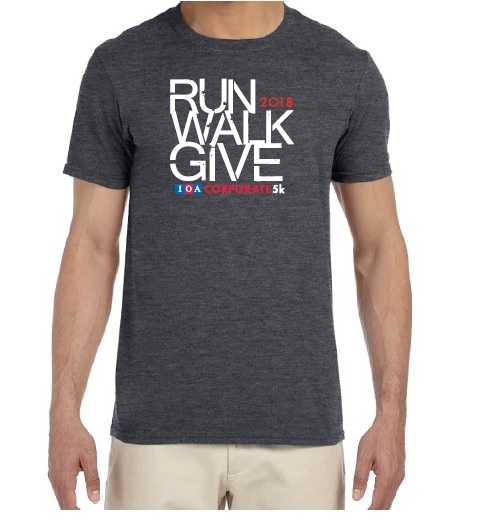 This year's runner/walker shirt is a cotton/poly blend in Dark Heather. Considered an athletic fit, this super-soft, lightweight and breathable shirt will look and feel slightly fitted through the chest and sleeves. Recognize the wellness advocate in your office. Nominate your co-worker for the Workplace Wellness Award! We've Got a New, Easier and More Effective Way of Scoring! 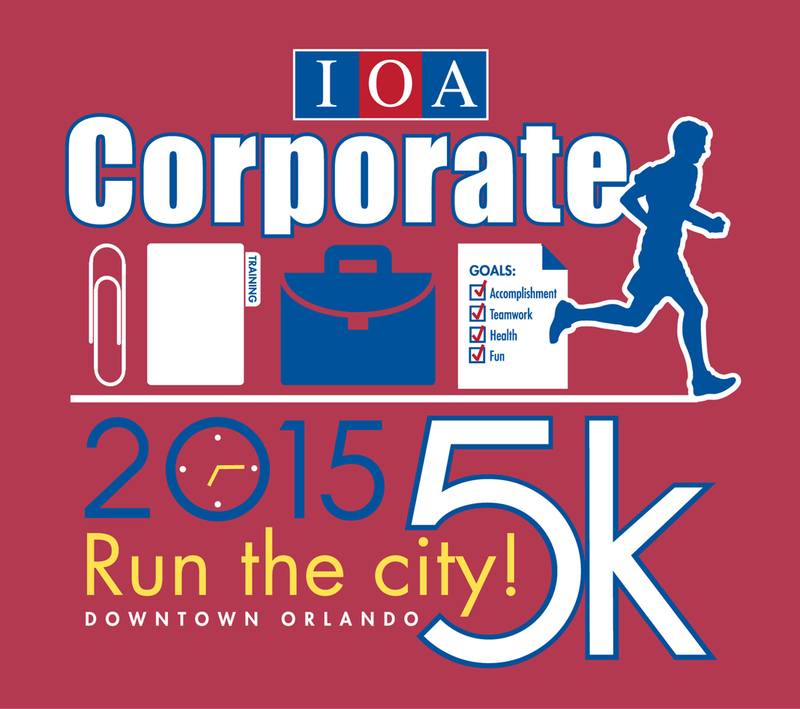 While last night’s IOA Corporate 5k seemed like a big-time race in downtown, it didn’t start out that way. In 1995, there were about 2000 runners and walkers which was considered a big local race at the time. It’s great that so many companies have continued to participate since that first year. IOA is one company that comes to mind. 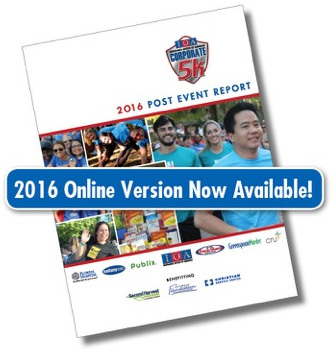 What's New with IOA Corporate 5k in 2017? • New Industry Award categories designed to increase friendly competition! • New online system – HAKU, we think you’ll love the efficient features and user-friendliness. The Workplace Wellness Award winner. Nominated by fellow employees from Wyndham Vacation Ownership, he ‘always strives to help others’ and ‘shares his knowledge and spreads his excitement to all around him’. He’ll receive: 3 month Orangetheory Fitness Membership Shoes from Track Shack Breakfast for 15 coworkers. Congratulations to CRU! Winner of the 2016 T-Shirt Design Contest with 299 likes on Facebook. SOLD OUT! Teams that reserved a tent will receive an email about choosing their tent location. 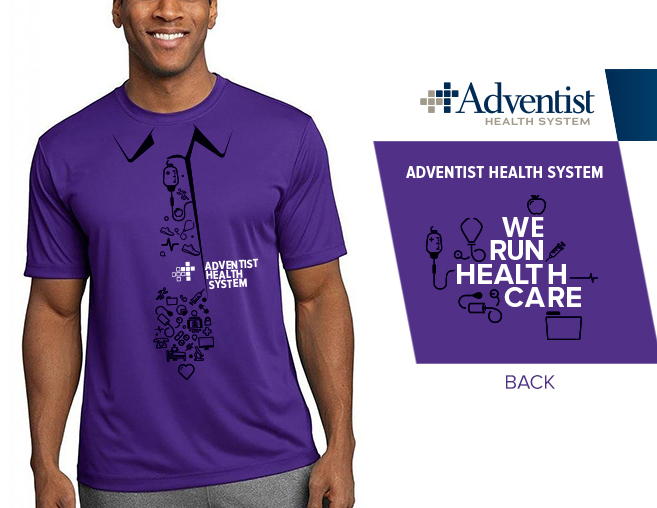 Congratulations to Adventist Health Systems, our 2015 T-Shirt Design Contest Winner! The Leadership Award goes to an employee that exemplifies leadership to improve health and wellness at work. The event was a genuine celebration of a 20-year effort to create healthy workplaces within Central Florida’s business and organizations. 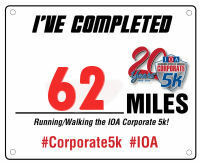 An all-time IOA Corporate 5k record was set! Registration is open! New features available! • Team captains can create their team and reserve a tent online in the "Captain Store" all in one transaction. • Customize registration questions for your team members. Would you like Turkey or Ham sandwich? • Non-employees can join your team and pay online even if the company is paying for all employees. • Partial payments accepted! If your company pays a portion of the registration fee ($20), now the participant can register and pay their portion online ($5). • Team captains can generate an invoice at any time. • Create your team today! Post a pic of New Balance for a chance to win a pair of New Balance and JetBlue tix! Congrats! The winner is Megan Clary of Stovash, Case & Tingley, P.A. Take a selfie and you could win a Microsoft Surface 2 featuring a 5.0 megapixel camera. Congrats! The winner is Mohammed Alkowni. Remember the 20th with coworkers and friends! Receive $750 OFF LASIK! Photos available on Facebook April 24. Garage and metered surface parking available throughout downtown. Reserve your tent early to get your desired location! Tent Prices will increase by $50 per size after Dec. 31, 2013 – ORDER EARLY!! Pride and confidence was the theme at last night's IOA Corporate 5k as 16,400 runners and walkers took over downtown Orlando to celebrate healthy living with co-workers, friends and family. 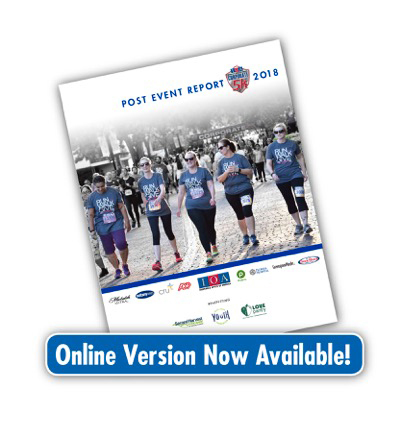 Central Florida's premiere night-time corporate run is among the largest in Florida and among the first races since the tragic incident that occurred during Monday's Boston marathon. Orlando Mayor Buddy Dyer's participation was a visible sign of his confidence that downtown Orlando is a safe place to be and that we should celebrate our quality of life with the people we live and work with. Kristen Tenaglia with New Balance ran 17:43 to claim victory as the Overall Female Champion. Take your photo in front of the JetBlue photo backdrop located in the Red, Blue and Gold tent zones at the IOA Corporate 5k and you could win a pair of airline tickets from JetBlue! 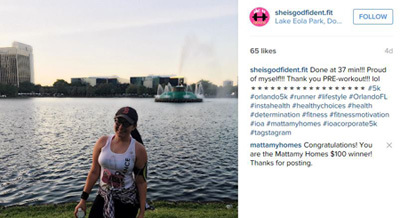 Upload your photos to the Corporate 5k Facebook Page. Winner announced Tuesday April 23rd. Post your favorite New Balance gear (shoes, apparel, accessories) on the Corporate 5k Facebook Wall Now through April 17th for a chance to win New Balance shoes from Track Shack. To add team members after online registration closes on April 4, bring paper registration form and payment to Track Shack. The Participant Registration Form is on the Team Captain page. Make checks payable to Track Shack Fitness Club. Voting has started! Vote here until Friday, April 12th @ 4PM. Tune in! Betsy Hughes will appear on Good Day Orlando, Fox35 on Thursday, March 28 at 8:00 am. Tent reservations have closed and are at capacity. Thank you Team Captains!